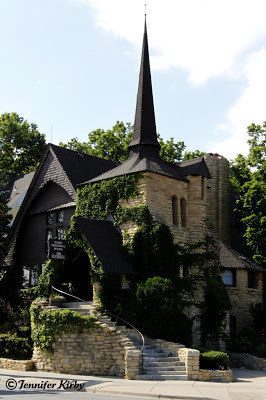 Built in 1890 by the infamous architect Cass Gilbert along with James Knox Taylor, this whimsical German church, in my opinion, invokes a Hansel and Gretel feel. With its shingle style architecture, the stone work looks like something out of Switzerland. Amazingly the church seems to fit perfectly in the hilly landscape and is hard to miss as you drive up Ramsey St to the Summit Avenue mansions. During World War I, the church was disbanded and is currently a professional building. This entry was posted on Monday, July 13th, 2009 at 11:42 am	and is filed under Historic Churches in Minnesota. You can follow any responses to this entry through the RSS 2.0 feed. You can leave a response, or trackback from your own site. It was also a funeral home in the seventies. I love architecture like this and I agree with hansel and gretel feel. It’s kinda cozy to. I’m partial to this feel it reminds of how my cabin feels at the drug rehab I work at. It was also the home of the excellent Eastside Theatre in the 1960s.